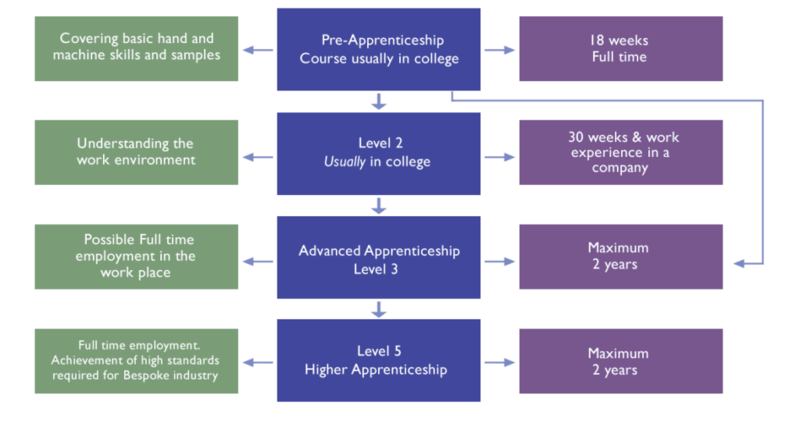 This qualification pathway table gives an overview of how you could plan your career in bespoke tailoring and specialise as a bespoke Tailor or Pattern Cutter. Listed below are some useful websites and college information on registered courses that teach tailoring skills and have accredited qualifications. Fasion-Enter Ltd is an award winning social enterprise that is currently the leading training provider in England for ABC Awards apprenticeships in garment technology, patterns and stitching. Accredited learning is available from level 1-5 providing excellent work based skills from garment conception to delivery. The college has a course set around tailoring for Men and Women and also offer small master classes. The college offers an introductory tailoring course and also provides the apprenticeship pathway courses set at level 2 and 3. This course is an apprenticeship in fashion and textiles and also covers: garment technology, pattern technology and tailoring alongside other course units. The course offered is a fashion and textiles diploma which covers sewing skill and pattern cutting.